Bahia Honda Bridge Trail | Florida Hikes! 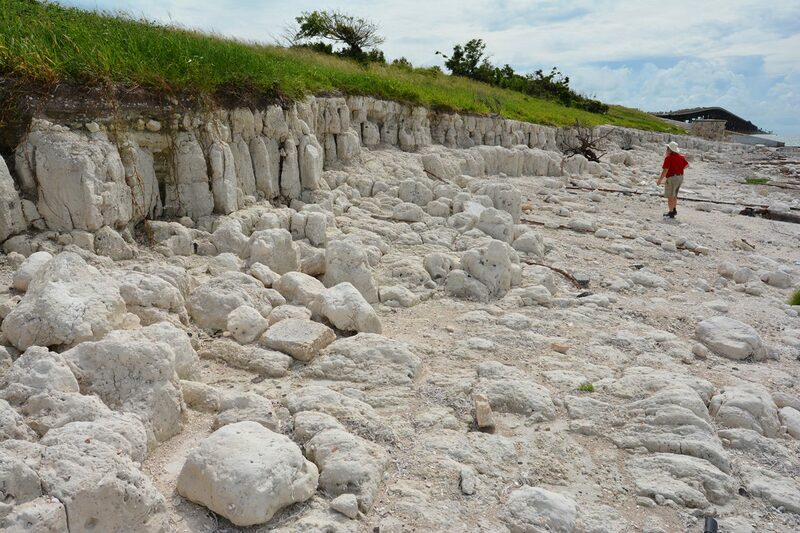 Stand above Bahia Honda State Park and take in a sweeping view from one of the highest points in the Florida Keys, an engineering marvel that spanned one of the deepest natural channels along the route of the Overseas Railroad. Bicycles not permitted. You must climb a staircase to reach the trail. Parking is across from the trailhead in the main parking area at the marina. 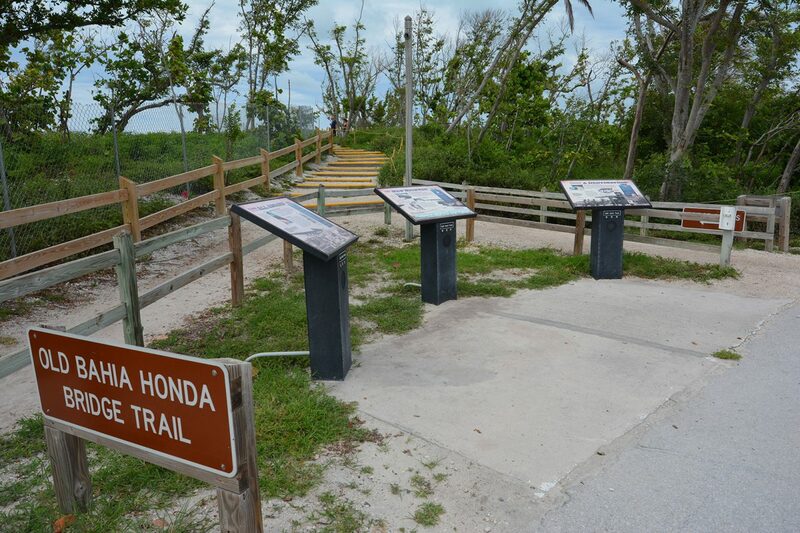 The entrance to Bahia Honda State Park is along the oceanside of US 1 at the south end of Bahia Honda Key. Once inside the park gate, follow the park road to where it now ends at the parking area. The trailhead is pretty obvious, across from the parking area in the direction of the restrooms. It’s the views that make this worth the walk, plus the rich history. We remember crossing this bridge as kids, looking out of the car and marveling how far it was to the ocean below. Today, it’s scary to see how much the highway deck – removed from service in 1972 – has crumbled. 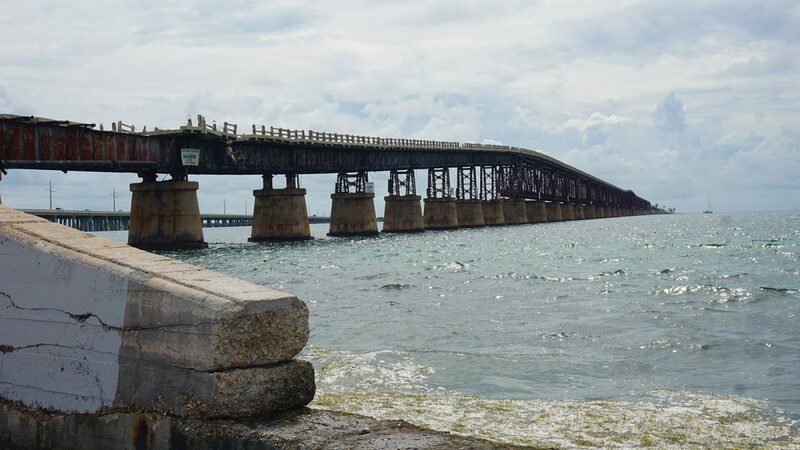 The narrow highway bridge was laid atop an engineering marvel, a bridge built to carry Henry Flagler’s Overseas Railroad across the deepest channel in the Florida Keys. 0.0 > A cluster of interpretive signs greet you at the start of this easy-to-follow footpath. They recount the historical significance of this short trail. Ascending the steps, you meet the original railbed of the Flagler Railroad, which was later topped with the Overseas Highway. 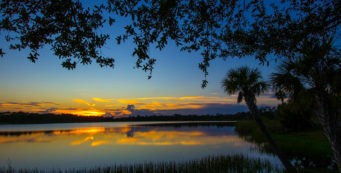 Before it became a state park, Bahia Honda was a Monroe County Park with wayside parks with beaches on both sides of the road. 0.1 > The trail provides a continuous gentle ascent towards the bridge. On our previous visits, you were shaded by a tropical hammock canopy with lots of large sea grapes. Hurricane Irma changed all that. 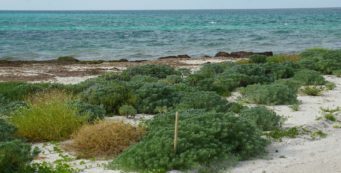 Not much of the forest remains, but you will see sea grapes and railroad vine. 0.2 > The barrier that prevents you from going any farther out on the bridge has been nudged closer to shore since we initially visited the park to write 50 Hikes in South Florida, so you no longer get a clear view of the engineering of the railroad bridge. 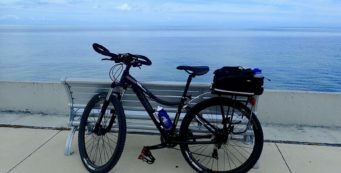 Still, this high point offers outstanding views, especially of the bay side of Bahia Honda, looking across the sweep of shoreline to the marina. You’ll often see anglers out in boats in the Atlantic and tour boats headed out for dives at Looe Key. 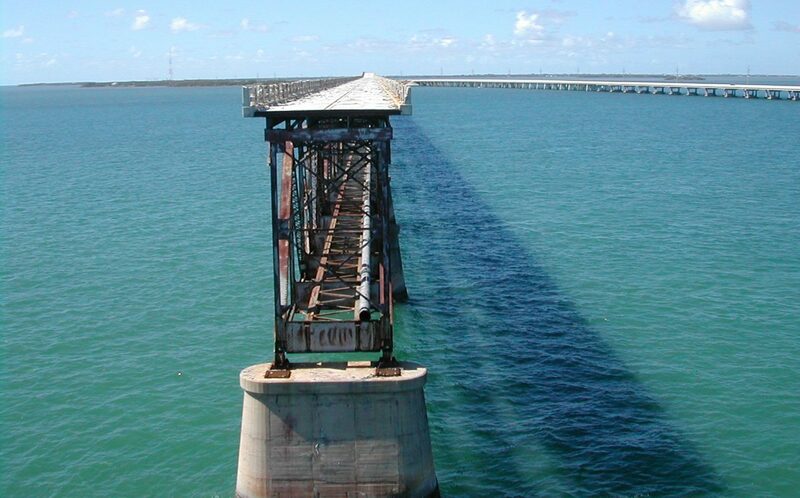 To get to Key West, the railroad had to span nearly a mile across the Bahia Honda channel. This bridge was one of the most difficult to build along the Overseas Railroad. First, the crews encountered deep water in Bahia Honda channel—up to 35 feet deep, which is very deep for the Keys. Nine concrete arches support a framework of girders from which the railroad tracks were hung from the trusses. The railroad is below you, under the old piece of the Overseas Highway that you are now standing on. In 1910, while this bridge was still under construction, a hurricane knocked one of these massive bridge piers out of place. It was repaired. It wasn’t until 1935, after the “Storm of the Century” washed over the Matecumbe Keys and destroyed the rail route, it went out of service. 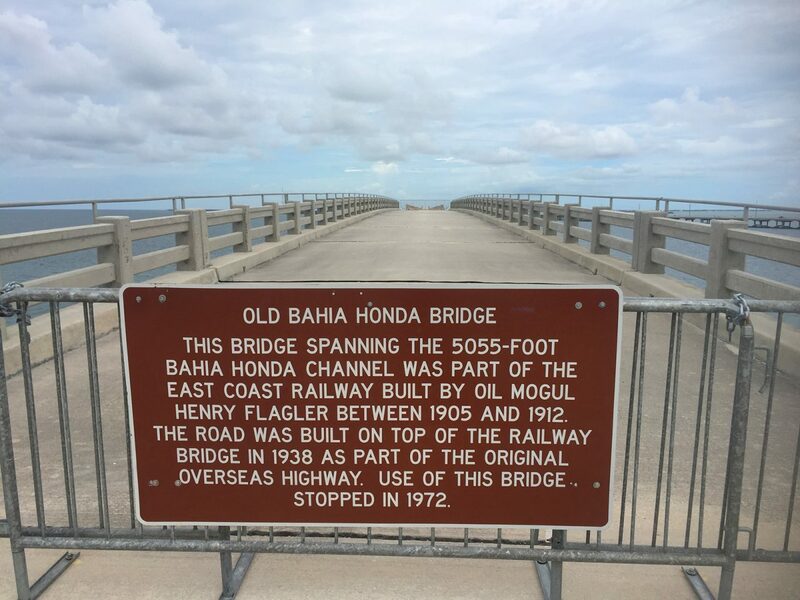 In 1938, the Overseas Highway was built on top of the girder bridge and remained in service until 1972. The top of this trail is as high as you can go, at least for now. Turn around here and follow the gentle descent back down to the parking area. 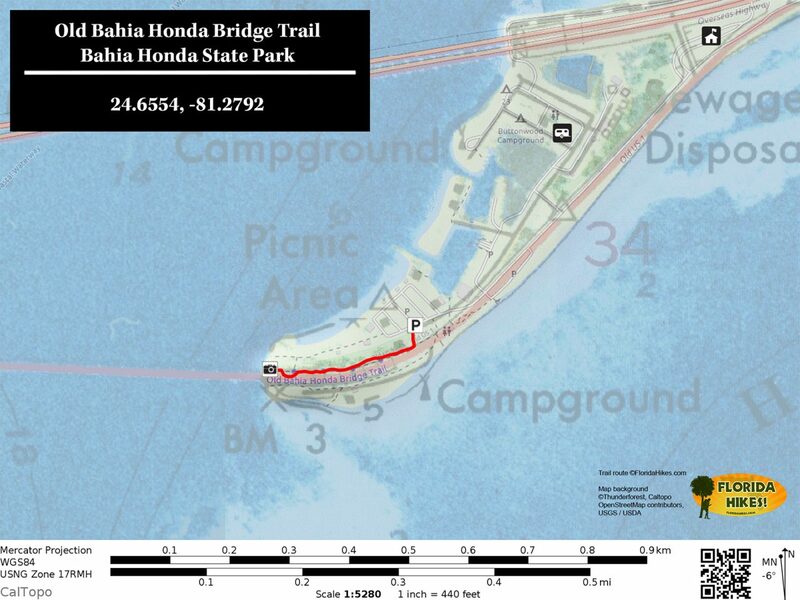 As we discovered, for those interested in the structural design of the old Bahia Honda Bridge, you can stand beneath it along a separate trail, the Bahia Honda Beach Loop. You can also get a better view of the archwork and girders of the bridge from the opposite side of the channel on Scout Key, which requires leaving the park and crossing the modern Bahia Honda Channel bridge on US 1 south. A pulloff on the ocean side offers a spot to walk down to the water’s edge past the ruins of an old wayside to see the bedrock that the railroad line rested upon, and the bridge from a different perspective. Here’s what this trail looked like prior to Hurricane Irma.